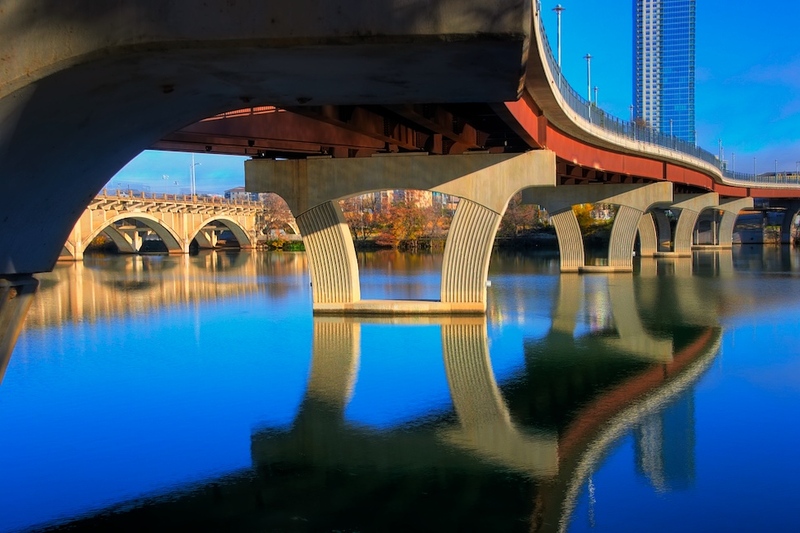 This is a shot of a pedestrian bridge in downtown Austin. I enjoy taking shots of bridges, and usually wind up underneath them trying to find cool views, in which I am usually successful. I thought this one had nice lines to it. From the top of this bridge you can get a nice view of our downtown skyline. The arched bridge in the distance is a frequent subject of mine, since it has those wonderful arches in it. In the old days, before this pedestrian bridge existed, you had to cross the distant one on a very narrow track. Every time a car went by it felt like you would get blown off the bridge. That pretty much stunk, but it's all better now! This is a 6 exposure HDR shot at f/13, with the exposures ranging from -3 to +2. The raw files were merged into an HDR in Photomatix, and then the HDR was adjusted in PSE for Curves, Contrast and UnSharp Mask.